Apple charges as much as $1,500 for its 2018 iPhone models and it also enjoys the highest profit margin in the smartphone industry… by a lot. Needless to say, that means it can no longer afford to include a 3.5mm to Lightning adapter with each iPhone. After all, that little adapter probably costs Apple all of $0.25 per unit. 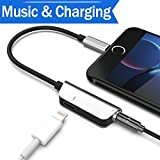 If you have a new iPhone XS or XR and you want to use wired headphones, pick up a Chooby Headphone Adapter. It’s just like the one Apple used to include with its iPhones, but it also has a separate Lightning port so you can charge your phone while you listen to music. Support iOS all System: This adapter lets you connect devices that use a 3.5 mm audio plug to your devices, iPhone 8/8Plus X/xs 7/7Plus, 6s/6sPlus/6/6Plus, Compatible with iOS 10/11/12 system. Free to Switch: it’s amazing fast.No need to install any plug-in, no Bluetooth, you just need to plug into,very convenient in operation. Stable Transmission Speed: Supports up to 48 KHz, 24-bit audio output,100% copper wire core with high-speed and stable signal transmission. 12-month Warranty: 24 hours customer service online, Worry-Free 100% Money-Back Guarantee, 12 Months Replacement Warranty.